Tears flowed freely, last Wednesday, as the charred remains of a Nigerian woman, her two children and two other persons coming from church were packed into nylon bags after the car they were being conveyed in was razed by a fuel tanker fire. The heartbreaking incident happened in Akure, Ondo State capital. It was a pitiable sight as residents of Shagari Village on the outskirts of Akure, where the crash occurred, cried their hearts out. The fire, sparked by the impact of the crash, which occurred at about 7pm at the Shagari Village junction on Akure-Owo expressway, consumed every object along its way. Eight vehicles, including a bus said to be owned by a baker, two buildings, five shops and many motorcycles parked at the junction by their operators, were not spared by the raging fire. The incident occurred metres away from a petrol station and it was by providence that the fire did not spread there, although two buildings close by were burnt. Eye witnesses said the accident occurred when the-ill fated tanker, heading to Owo, was trying to avoid a car coming from Araromi area of Akure which drove into the highway recklessly. The tanker, on high speed, lost control and fell on the car, spilling its content which instantly went up in flames. The driver of the tanker, who Vanguard learnt was unhurt, fled. The state Fire Service did not immediately respond to distress calls as eye witnesses said the blaze had gone down before some fire fighters came with one vehicle. Some youths wanted to attack the fire fighters but commonsense later prevailed and they were allowed to quench the fire. An eyewitness, who operates a motorcycle at the junction, Tope Oyinloye, said “what happened was like a film”. Oyinloye went on, “It happened few minutes to 7pm. I just dropped a woman l picked from Adegbola Junction and l was trying to make a u- turn when l saw a Corolla car descending the hill and coming towards the junction. “The speed was high and l discovered that a tanker was also coming from the NNPC side of the highway also on high speed. The tanker approaching the junction was hooting but the driver of the car thought he or she could cross to the lrese road but the tanker was too fast for him or her. “The tanker driver trying not to crash into the car, which was right in the middle of the highway, swerved but by the time he wanted to manouvre back to the highway, his truck tumbled and caught fire. “The tanker landed on its side and the content burned everything in the vicinity as it flowed everywhere”. Oyinloye said that the Corolla was not lucky as the tanker fell on it while the fire roasted the five occupants believed to be coming from church. He added that the deceased were trapped and burnt inside the vehicle. The identities of the deceased persons could not be ascertained. Sources at the scene said that three of victims were members of the same family while the two others were church members who were given a ride after that Wednesday programme in church. Vanguard was informed that the mother of two children who were also in the Corolla car was the driver. The spokesman for Ondo State Police Command, Femi Joseph, confirmed that five occupants of the Corolla car were burnt to death. Joseph said, “We have not really ascertained if those who died in the car were family members. Investigation continues”. He blamed the crash on the recklessness of the driver of the Corolla which drove into the junction unexpectedly. Meanwhile, owners of vehicles who were smart enough escaped being burnt as they jumped out of their vehicles when the crash occurred. 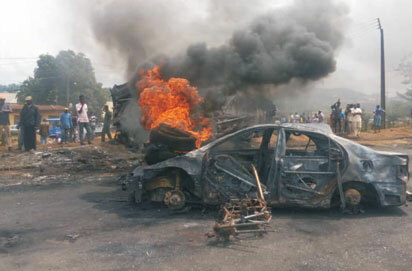 Barely 12 hours after the incident, residents of Shagari Village took to the streets to protest what they called government’s insensitivity to the incessant and avoidable loss of lives at the junction. For hours, they locked down the highway, insisting that government at the state and federal levels should be alive to its responsibility of saving lives. The residents lamented that government had failed to do something to the portion of the highway which they said had claimed many lives in recent time. The leader of the protesters, Daniel Olutayo, said that “the accidents that had occurred at that portion of the highway were avoidable if government had been sensitive to the complaints of the people living in the area”. Olutayo asked government to either erect speed breakers at the junction or construct a flyover or expand the road as a preventive measure to the crashes on the road. “We have to stage this protest because if we don’t, our government would not know what we are facing in this area. Many lives have been lost on this road. The state Deputy Governor, Agboola Ajayi, visited the scene to appeal to the protesters to allow free vehicular movement. Ajayi, who said that the State Emergency Management Agency (SEMA) had been mandated to assess the damage the crash had caused, assured that survivors would get relief items. He, on behalf of the state government, sympathized with the people, particularly those who lost loved ones and properties to the incident. According to him, government would construct speed breakers on the road to check reckless drivers. The Deputy Governor also said traffic controllers will now be on ground, from 6am-8pm, to control in and out of vehicles around the area. “We will erect bumps on the highway within two weeks”, he said. He lauded officials of the Nigeria Security and Civil Defence Corps, Nigeria Police, Federal Road Safety Corps and Ministry of Work, who were responders at scene of the crash.